Goliath-Werke Borgward & Co. was a German car manufacturer started by Carl F. W. Borgward and Wilhelm Tecklenburg in 1928, and was part of the Borgward group. Goliath was based in Bremen and specialized in three-wheeler cars and trucks and medium-sized cars. Their vehicles were sold under the Goliath brand. 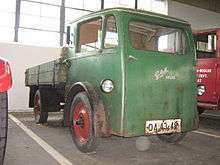 The first models were three-wheeler trucks derived from the Blitzkarren previously built by Borgward. The first passenger car was the Goliath Pionier in 1931, which still had three wheels and a one-cylinder engine. Until 1934, 4,000 of these small cars were produced in various types of body. 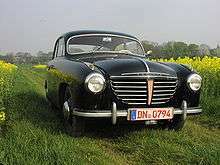 The Pionier was considered as a forerunner of the Hansa models 400 and 500. These were front-wheel-drive two-door sedans, station wagons and coupes. Goliath GP700 (1950–1957) — inline-two-cylinder, two-stroke, water-cooled, transverse engine (anticipating the Mini and many recent cars). In 1952 Goliath introduced Bosch direct fuel injection, around the same time as the Gutbrod Superior 600; they were the first two cars to use this technology. Goliath GP900 (1955–1957) — inline-two-cylinder, two-stroke, water-cooled, transverse engine, available Bosch direct fuel injection. Goliath 1100 (1957–1958) — four-cylinder opposed four-stroke water-cooled engine. Renamed "Hansa 1100" to shake the three-wheeled minitruck image. Goliath Express (1953-1961). A front engined, front wheel drive design offered in pickup, panel van and windowed van bodystyles. Available with the 688cc engine from the GP700, the 886cc unit from the GP900 and, from 1957, with a new 1093cc engine. 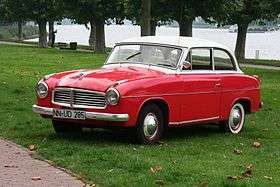 From 1958, the Goliath 1100 models were sold under the brand Hansa; the Borgward group wanted to downplay the two-stroke engine and three-wheeler image. Three years later, in 1961, the Borgward group collapsed. Wikimedia Commons has media related to Goliath vehicles.